The first innings of Zimbabwe was folded back on 211 runs in 76.4 overs and the Windies were in some sort of trouble by losing two early wickets for 18 in 11 overs. 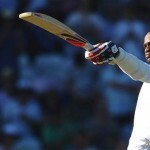 The first Test of the two match series kicked off on Tuesday, March 12, 2013, at Kensington Oval, Bridgetown, Barbados. Earlier, Brendan Taylor, the skipper of Zimbabwe, won the toss and opted to bat first. The innings was initiated by Tino Mawoyo and Vusi Sibanda with great caution as the first three overs ended as a maiden. Sibanda was dropped in the next over by Darren Bravo off Tino Best at four runs but succeeded in getting two fours. Mawoyo opened his account after 17 balls with a single as Sibanda was clean bowled by Kemar Roach for 12 on the last ball of the seventh over. Hamilton Masakadza took guards at the crease next as Mawoyo hit his first four in the 13th over. The batsmen found it difficult to penetrate the bowling and reached 33 after 15 overs but added 24 runs in the next four overs with 4 boundaries. Masakadza became the next victim of Roach for 17 as the score touched 59 and in came Brendan Taylor who tried to stabilise the innings with Mawoyo. The pair changed the mode of the game by dispatching the ball out of the fence regularly as Tino Mawoyo attained his second Test fifty in the 30th over and the first hundred of the innings also appeared on board. Mawoyo was gone in the next over for 50 off 95 balls with 7 fours and was replaced by Craig Ervine. 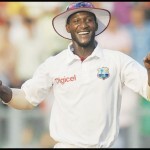 Taylor added a couple of fours in the 34th over as Shannon Gabriel destroyed his stumps after he had scored 26 runs. The fourth wicket fell at 110 in 36 overs as the middle order batting surrendered against the quality bowling of the Caribbeans. The visitors lost their sixth wicket at 158 when the stumps of Craig Ervine were uprooted by Marlon Samuels for 29 runs. Regis Chakabava and Graeme Cremer provided some resistance against the rival bowling as the first was dropped by Best at mid-off on the bowling of Shane Shillingford. Cremer got 2 fours in the 60th over and the duo crept to 196 when he was dismissed for 25 runs. Chakabava was sent back to the dressing room at the same total for 15 and the entire Zimbabwe team was bowled out at 211 runs in 76.4 overs. 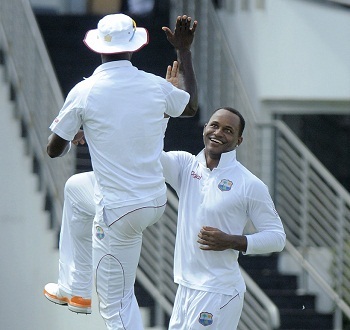 Marlon Samuels was the most lethal bowler who grabbed four wickets for just 13 runs in 6.4 overs. Shane Shillingford held three, Kemar Roach two whereas Shannon Gabriel claimed one wicket. 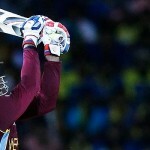 Chris Gayle and Kieran Powell opened the innings for West Indies in a timid manner as they scored four mere runs in the first six overs after playing four maidens. Powell hit the first four of the innings on the first ball of the next over as Kyle Jarvis got rid of him and the next batsman Roach in the same over. Gayle hit two consecutive fours in the 8th over and remained unbeaten for 11 and Darren Bravo has yet to open his account as the hosts scored 18 runs while consuming 11 overs. Zimbabwe has come back to the game by grasping two quick wickets But West Indies has a tall batting line up which can take a sizable lead in the first innings.